Dress up your doorway or entrance with our newest fresh wreath. Handcrafted with the finest evergreens including noble fir, western red cedar and boxwood, we’ve decorated the wreath’s fragrant circumference with a festive touch of natural sand dollars and starfish. Clusters of faux red chilli berries and large grosgrain bow provide a final flourish. To remove wreath, snip plastic ties from the back of the box and lift the item gently. Our fresh designs are originally produced with extra elements so slight shedding is normal. 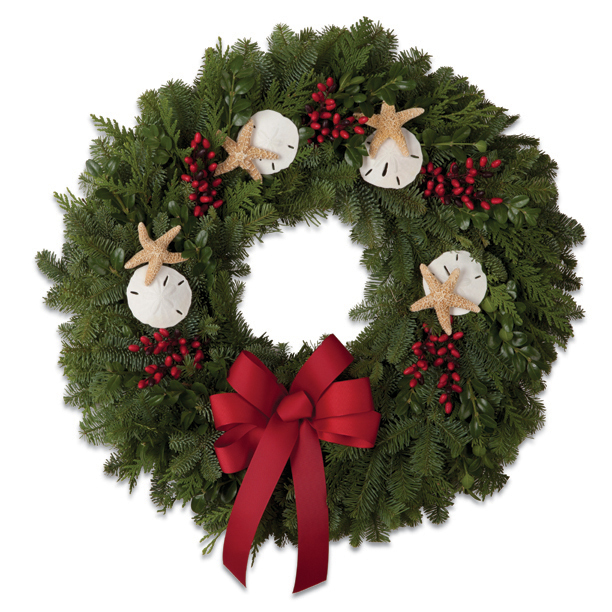 To keep your wreath fresh for the longest possible time, mist occasionally with water. These designs are best maintained when displayed indoors, away from direct sunlight, strong heat sources and extreme moisture. Their colors will soften over time.